What is your reaction to this Holocaust painting by Juliette Aristides? Now on display in a one woman show Observations at the Reading Public Museum that continues until September 14, the large canvass titled 1945 (Bendheim Remembrance) attracts rapt and immediate attention. Ownership of the painting quietly changed hands during the opening weekend, shortly after Alison Rotenberg brought her husband Dr. Larry Rotenberg MD, a child survivor of the Holocaust, over to see saying: “We’re buying this.” The Rotenbergs plan to temporarily place the work in their Reading, Pennsylvania home, for depth of contemplation and then move it to a more permanent, public venue. See their interview following the jump, and see Dr. Rotenberg’s article A Child Survivor/Psychiatrist’s Personal Adaption in the Journal of the American Academy of Child Psychiatry. How do I know all of this? Full disclosure: Juliette Aristides is my step-daughter, though she was an adult when I married her father, Barry Bub, then a family practitioner in Reading, PA. Juliette was born in South Africa, and while yet in her infancy, immigrated with her parents to Reading, PA. Many family members were murdered in Nazi death camps on both the paternal “Bub” and maternal “Bendheim” sides of her lineage. Her long period of research and work on the canvas was encouraged and funded by a surviving branch of the Bendheim family. Juliette’s usual theme in her art is “beauty” — making this work all the more significant. When I first saw this painting, it was unframed, leaning against a wall in Juliette’s atelier in Seattle. Tears rushed in as I witnessed this new evolution in Holocaust-related art. Even so, since the painting’s inception I had wondered how this interpretation might affect survivors and their loved ones-both here and overseas. The couple who will take possession of the painting when the show closes, Alison and Larry Rotenberg were willing to be interviewed for this article. They own several other pieces of her work and have known her since childhood when she was an art student. I ask Alison, a retired realtor in the Reading area, what touches her in the imagery, some aspects are so subtle that they can only be discerned by viewing the 49″×72″ oil on canvas work in person. Because he knows, a frightful fiend. “The immediacy of the past was still sufficiently there to keep this from occurring. Well, it is so that what doesn’t kill me makes me stronger. In a sense this couple carries with them a hope of humanity, a hope of the world. If you go back to the Talmud it teaches that one who saves a life, saves the whole world. This painting captures aspects of that, too. Each human being contains a world that lives within him or her and dies within him or her. Triumph and tragedy are combined in this picture, evocative of the importance of the singularity of human survival. Observations, the solo exhibition of works by Seattle artist Juliette Aristides continues until September 14 at the Reading Public Museum. The bill in the Education Committee and is coming up for a vote on April 8. We are urging everyone to contact Mr. Paul Clymer (chair of the Education Committee) He can be contacted by calling tel. 717-783-3154. Please leave a message indicating you support the bill. Also have your friends and relatives do likewise. Rabbi Eric Yanoff led a procession from Temple Adath Israel to Merion Park to mark the shloshim (30-day mourning period) for the victims of last month’s massacre in Toulouse, France, and to commemorate the eve of Yom Ha’Shoah (Holocaust Remembrance Day). We remember Rabbi Jonathan Sandler. 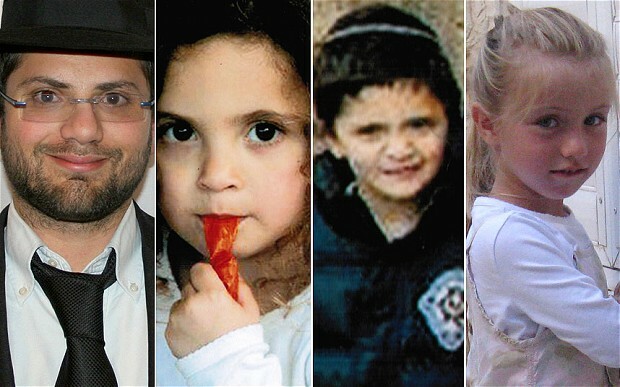 They were gunned down outside of the Ozar Hatorah school in Toulouse simply because they were Jews. Rabbi Yanoff led the march to the stream in Merion Park where every year at Rosh Hashanah the community comes to say the tashlich prayer and expunge their sins in living water. After his remarks, he led the crowd in a recitation of kaddish in memory not only of the Toulouse attack victims, but of all who perished l’kiddushat hashem — in sanctification of the Holy Name. As we were approaching the eve of Yom Hashoah, we were especially mindful of the six million Jews who were martyred during the Holocaust. May their memories be a blessing to us all. Zichronam l’Vracha. Helen Loeb who grew up in Toulouse shared her feelings. I remember when my husband called me to tell me about the shootings on that tragic Monday. I just could not believe it. We always had some kind of security around Jewish buildings in Toulouse but we never took it seriously. Somehow, we felt nothing would happen in suburban Toulouse. I now feel that anything can happen anywhere and it is very hard to build security. I am thankful to Rabbi Yanoff of Adath Israel for organizing this event. It feels good to see how people came to march for the victims on this shloshim. As it happens it is also Yom Hashoah. Let us all pause today and recite Kaddish to remember the victims of antisemitism, then and now. As before since an Act of the Knesset in 1951 we will again on the 27th day of Nisan (May 1, Sunday) mark Yom HaShoah (Holocaust Day). A large crowd will gather on the Parkway in front of the first public monument erected in America to memorialize the 6 million Jews whose lives were taken between 1938 and 1945. With speeches, songs, and solemn ceremony we will honor a rapidly dwindling group of grey-hair direct survivors. All of this warranted homage not notwithstanding, the subject can actually be likened to a Third Rail of modern Jewish thought: we have learned since giving it a name in the 1960s that it is “charged” with power (in this case, negative emotional power). Given our druthers, we prefer to have as little to do with it as possible. Indeed, its connotations are so dark and foreboding that many parents shield their children as long as possible from any mention of it. In November 2010, I used the Internet to reach 134 Jewish-Americans who, at my request, provided me with the 5 words they associated with then Holocaust in general, and concentration camps in particular. Most often mentioned among the 670 words – and arranged here in alphabetical order – were these five: death, horrifying, inhuman, pain, and sad. Cited three or more times were such words as Atrocity, barbaric, brutality, death, degrading, evil, family, fear, gas, genocide, Hitler, horrifying, inhuman, loss, Nazis, pain, sad, starvation, suffering, terrifying, torture, tragedy, tragic, unbelievable, unforgivable, and unthinkable. To be sure, among the word associations there were a few positive terms; e.g., courage, educational, endurance, faith, family, heroism, hope, love, real, resilience, resistance, sacrifice, and survival. However, these made up only two percent of the total. All the more surprising, therefore, is the use made of many such words in nearly all of the 115 memoirs and scores of oral histories I consulted in my on-going study of the matter. Breaking with Convention. My own list departs considerably, as it includes five brow-arching words (listed alphabetically) not included in it – the words Caring, Cooperation, Pathological, Unforgivable, and Vindication – three of which obviously warrant clarification. Caring? Yes, as some Jewish prisoners in German occupied territories, in the ghettos, and in Annihilation Centers and slave labor concentration camps dared to try to help care for one another – even though this was strictly forbidden, at pain of punishment unto death. I call this stealth altruism, the secret and forbidden sharing of care in the Lager, and explore it in depth hereafter. Vindication? Yes, as many such prisoners set out to prove they would and could resist dehumanization forced on them by the Nazis, and this helped vindicate their pre-camp faith in themselves and in others. Holocaust/Concentration Camp word association lists (perhaps yours) commonly focus only on horrendous things done to the “Other”, what I hereafter join colleagues and commentators in calling the Horror. My list takes this into account, but goes on to also recognize what I call the Help, namely, ways in which some victims tried to share care and scarce resources (done for one another) at personal sacrifice and high risk of torture and death. My focus is on stealth altruism, a scarce, though nonetheless consequential behavior in which all of Jewry (and our Gentile friends) can take pride, a type of empathetic outreach we would do well to emulate. Done to … done for … very different terms, each focusing on a different actor (the first, the Nazis; the second, their Jewish prisoners). They emphasize different behavior (the first, Nazi cruelty and punishment; the second, Jewish prisoner support of one another, even at personal cost and peril). Conventional lists and 60-plus years of Holocaust memorialization focus on ” done to the Other,” what I call the Nazi Story, one of unforgettable and unforgivable murder. My list goes beyond it to also include what I call the Jewish Story, or the provision by some Jewish prisoners of forbidden help (done for one another), as guided often by Judaism’s emphasis on mutual responsibility (we are our brother/sister’s “keeper” ). In the concentration camps, stealth altruism ranged across a diverse and large continuum. At one end it involved such actions as outlawed hidden gestures (nods and smiles), which risked crippling beatings. At the other end, prisoners took forbidden in-the-open risks to try to save lives; e.g., Labor Camp, Winter, 1945: “We [ women] had to constantly keep a watchful eye on everyone [in the work crew] , especially the very young and old … Many had reached a point of lost hope … They simply stopped working [at digging anti-tank ditches in the frozen soil], sat down on the ground, and froze to death …We continuously attempted to provide [forbidden] encouragement and strengthen spirits … ….” (Farkas, 55) This sort of “done for one another” caring mixed commitment, compassion, and courage – in full knowledge of vulnerability to death from unpredictable SS actions. Asked why such experiences in the camps had not embittered him, a survivor explained – “I learned about friendship in Auschwitz. When I was cold, strangers shielded me with their bodies from the blowing winds, for they had nothing else to offer but themselves.” (Lustig, in Eliach, 107). That shield, and 101 “done for … “counterparts, helped secure still another day, and thereby physically and spiritually aided otherwise unbearable lives. The Nazi Story – our long-standing preoccupation – does not help us frame the kind of questions that allow us to ” make the human connections … [questions] which lie at the root of all purposeful inquiry. [It leaves] the repetitive cruelties, the blank anguish of pain and despair, indecipherable.” (Clendinnen, 3) We can and must move beyond it. expected to bring forth new understanding and new realization.” (Heschel, In the very near future the last of the direct survivors (and perpetrators) of the 1933-1946 Holocaust will pass away. In the aftermath we will inherit responsibility for shaping a fresh telling of the greatest crime of the 20th century, a persuasive re-telling that should lend a special meaning to 21st century life. We could break with memorialization tradition and adopt a new approach, one that emphasizes not the Horror of Nazi insanity, but instead the Help that victims shared with one another. Were we to do so Jews here and elsewhere would finally understand how very much we have to be proud of in the record of our co-religionists in extremis. Background. As a pre-teen in the early 1950s I began a lifelong practice of seeking out autobiographies of survivors and novels that could help me understand what had happened in an abattoir almost beyond belief. Unimaginable atrocities shook me to my roots, but I dwelled instead on rare accounts, as of the Warsaw Ghetto uprising, of efforts made to stay human under conditions in extremes. Likewise, years later, on my second visit to the U.S. Holocaust Museum, I found myself drawn more to a temporary exhibit in the lobby (“Deadly Medicine: Creating the Master Race”) than to permanent museum material (such as the Tower of Photos, the empty railroad car, the audio-visuals desks, etc.). It emphasized ways to help improve medical ethics, while also noting horrendous related Nazi crimes. A judicious balance of reform ideas along with a scathing condemnation of unforgivable acts, the exhibit gave me hope progress might soon be made in this medical matter. In the summers of 2005, 2006, and 2010 my lifelong interest here had my wife, Lynn Seng, and I visit six European concentration camps: Auschwitz-Birkenau, Dachau, Mauthausen, Plaszow, Ravensbruck, and Theresienstadt (Terezen) – the “model” Nazi concentration camp to which we went twice. Over the years we have also gone to several new and old Holocaust Museums here (including the newest such museum in Skokie, Illiniois)and abroad (Britain, Canada, Denmark, France, Germany), to the new Holocaust History Museum at Yad Vashem (which I have visited seven times since 1971), and numerous war memorials in nearly a dozen European Out of Balance. I was left troubled by something I found everywhere over-represented. This crystallized when during a two-week East European tour in the summer of 2006 we became increasingly uneasy with the narrative shared by an American-born senior Professor of Holocaust Studies. His tour, which included remnants of the Warsaw Ghetto, Schindler’s factory, the Holocaust Memorial in Budapest, and two concentration camps, featured graphic stories galore of Nazi atrocities. No examples were ever shared of victims nevertheless trying to care for one another. Nowadays, when I remember a Holocaust Museum or concentration camp exhibit hall, I recall five educational themes of very different weight: 60 percent or so of the material graphically documents unspeakable, gruesome crimes (executions, murder, torture, etc.). We gasp, recoil, and even avert our eyes. Fifteen percent or so explores slightly less horrific material, such as vandalized shops, schools, or synagogues. Ten percent or so explores the post-liberation lives of survivors (reunited families, newborn children, etc. ), and another ten percent or so looks back on a pre-Holocaust bucolic scene of (false) security in pre-Hitler Europe. Perhaps five percent or less allows for the possibility that some of the victims may have struggled to keep in touch with their humanity. The covert creation of networks of mutual support under German occupation, in the ghettos, and in the camps, gets short shrift, if it gets any attention at all. Rachel Korazim, director of Education at Yad Vashem, the Israeli Holocaust memorial museum, puts the matter quite well – “We’ve managed to place images like barbed wire and crematoria as central Jewish images. This is not Jewish history, this is Nazi history.” (Silverman) Is the current preoccupation with evil the only, or even the best approach – given the challenge we have to help keep the narrative consequential? Is a Holocaust memorialization strong in evil-focused motifs still our wisest course? Might a new balance of Horror and Help favor greater appreciation of the narrative? In the Camps. Testimony to our will to stay human is available from Terezin, a “model” concentration camp that was actually a transport center to the death camps. Doomed teenagers there nevertheless created a literary magazine despite knowing any day they might see their registration number posted for transport east to the gas chambers. Their essays dealt with a wide range of subjects, from A to Z, except for the immediate plight of both writers and readers: Emphasis was put instead on matters that might help lift the spirit, rather than bruise it all the more. Yehuda Bauer, an Israeli Emeritus Professor of Holocaust Studies, notes that “even in these [horrific] conditions, literature, music, theater, and art flourished. And, still today, the musical pieces, poetry, and plays made at Terezin continue to be heard around the world. … We must not only remember them, which is a cheap and superficial cliché – we must learn from them.” (Makarova, et. al.). Remarkable movies of actual camp experiences also help illuminate what Good can mean in the face of Evil. (Insdorf) A film version of Imre Kertesz’s semi-autobiographical novel, Fateless, has a young camp-savvy prisoner selflessly chose to mentor a 14-year old newcomer in life-saving skills. The boy and other non-observant Jews later look on admiringly from their bunker beds as four old men risk all by clandestinely marking the Sabbath. Likewise, characters in Stephen Spielberg’s film, Schindler’s List (especially “Isaac Stern,” the accountant) risk their lives to help keep 1,100 other prisoners alive. (Romano 2006). Especially revealing is a Cable TV film, Out of the Ashes, the true story of Dr. Giselle Perl, a Jewish female doctor forced in Auschwitz to work for Dr. Josef Mengele. She helped infirmary patients recover, even knowing they might be killed later that same day. Risking her own life, she secretly moved about the camp at night to perform abortions on about 1,000 otherwise-doomed prisoners (pregnancy was against Nazi rules), and, in some few cases, smother their newborns – an act of mutual aid en extremis. One Survivor’s Tale. I learned more about all of this from a recent writing project I never expected to have as part of my life. In 2005 I was fortunate enough to make the acquaintance near my Narberth, Pennsylvania, home of an elderly East European survivor, Henry Skorr. Over the next several months I tape-recorded 60 hours of his life history in Kalisz, Poland, and later, in Siberia. (During that time the Spielberg camera crew filmed two sessions with him.) 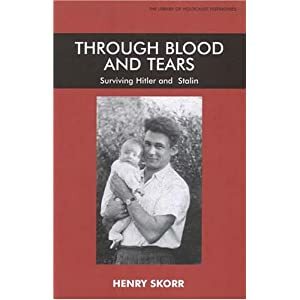 With help from Ivan Sokolov, a graduate student who recorded and transcribed far more hours than I, and Ann Weiss, another Holocaust writer, we saw the project through to its 2006 publication as a remarkable 384-page autobiography, Through Blood and Tears: Surviving Hitler and Stalin. Quick to deny singularity, Skorr insists each person in his book, only some of whom “bested the evil that attempted to destroy us, endured equally as horrific, sensational, and sometimes uplifting journeys”. A total stranger, for example, hid him under her large skirt when German soldiers suddenly searched a train station in which they sat. Later this older Jewish woman shared what little food and money she had to help him make his escape, explaining with a smile he needed it more than she did. A Jewish blacksmith took his little brother under his protection when they were all captives, and, defying a German officer, saved the boy’s life when Skorr could not do so. Over and again Henry details “uplifting” situations of mutual aid given at peril of life. On November 9, 1939, for example, at considerable risk, Skorr’s father, a popular kosher butcher hastily rushed a gang of local Jewish gangsters to a small town bordering on Germany. There, under his leadership, they rescued German Jews who had arrived earlier that day fleeing from the “Kristallnacht” pogrom, only to find themselves then seriously threatened by Nazi-allied Polish townspeople. Skorr’s mother, in turn, regularly sheltered and fed dazed and distraught Jewish refugees, although her own large family had less and less. Many of their besieged neighbors (though by no means all) warned one another about surprise Nazi sweeps of households, and in other high-risk ways, desperately sought to remain neighborly. Finding a Balance. It is time the dark and complex puzzle we know as the Holocaust included aspects under-valued in present-day telling, aspects of a narrative that would highlights deeds worth emulation. We need to pay attention to what enabled besieged men and women, like Henry Skorr, Primo Levi. Eli Wiesel, and others, to maintain their moral values, dignity, and humanity? What combination of hope, integrity, morality, and strength enabled some to survive long after others had given up? What enabled some to trump their circumstance and defy a destructive script written for them by their Nazi captors? An effort to establish a new balance of Good and Evil in recounting the Story will have opposition. For one thing, many concerned parties insist on staying focused on atrocities, the better to keep the flame of outrage burning. They identify the Holocaust exclusively with unmentionable horrors, and their preoccupation with abominations allows no room for any other consideration. Second, soupy homilies and airy platitudes might be advanced in place of confounding complexities. We must avoid characterizations of victims that are overly heroic. Finally, there are those who will always believe the enormity of the Holocaust overshadows any effort we might attempt to reframe it. They contend it should not be used instrumentally even if to promote the admirable cause of mutual care and This opposition notwithstanding, we can and should revise Holocaust educational and exhibit material. More attention should be paid to the efforts victims made to hold onto their humanity despite the depravity inflicted upon them. Scattered, out-of-sight, and often hard to secure evidence of fundamental goodness merits fresh exploration, this time in a creative and nuanced way. (My new book is rich in examples). In the last analysis, strategies of memorialization are transitory and incomplete. As there is no “copyright” on ways the Holocaust will be remembered, we have room to re-assess where we chose to place our emphasis. To date we have under-valued how some men and women who suffered hardship struggled to overcome adversity. It is time we experimented with a re-balancing of the entire narrative – a re-balancing that might uniquely help meet critical 21st century spiritual needs of Jews and non-Jews alike. In this way we can demonstrate anew our potential to help shape a finer future for ourselves and our progeny, a refutation of the Nazi insistence that only some (themselves) and not all of us have this awesome power and responsibility. Re-balancing the way we memorialize the Holocaust can help pass along a history that honors its 13 million-plus victims as never before, and promotes a future that honors us all. Romano, Carlin. 2006. “Is the Crematorium Half-Filled or Half Empty?” Chronicle of Higher Education, September 22: B13. Shostak, Arthur B. 2007. “Humanist Sociology and Holocaust memorialization: On Accenting the Positive.” Humanity & Society, Vol. 31. February. Pp. 43-64. About the author: Art Shostak, Emeritus Professor of Sociology at Drexel University, retired in 2005 after 42 years of enjoying himself sharing ideas in such courses as Futuristics, Social Change and Social Planning, Social Problems, and others. He authored, edited, or co-edited 34 books and over 160 articles. He is currently finishing a book entitled Stealth Altruism: Jewish Care in Nazi Camps. He welcomes ideas and material for it, and can be reached at [email protected].